"… the BGC [ICANN Board Governance Committee] admittedly did not examine whether the EIU or ICANN staff engaged in unjustified discrimination or failed to fulfill transparency obligations. It failed to make any reasonable investigation or to make certain that it had acted with due diligence and care to be sure that it had a reasonable amount of facts before it.--Dot Registry IRP Declaration--see this week's FEATURES further below. • “The artist Christopher Wool has a word painting, 'Sell the house, sell the car, sell the kids.' That’s exactly how I feel – sell everything. Nothing here looks good ... The stock markets should be down massively but investors seem to have been hypnotized that nothing can go wrong." --Jeffrey Gundlach, CEO of DoubleLine Capital. See also: Goldman Turns Outright Bearish: Says To "Sell" Stocks Over Next 3 Months | ZeroHedge.com. • Angela Merkel condemned: 'Germans have had enough' - thousands of people took to the streets of Berlin to protest against the German Chancellor’s open door policy - Polish experts claim 'Europe is dead' - Europe 'at the end of its existence' following a summer of terror and the EU’s free movement policy. An ex-Polish counter-terror officer has warned 'the whole Balkans are flooded with weapons, and from the Balkans have come two million people. Together with them came arms dealers, gangsters, drug dealers. Buying a Kalashnikov in Bosnia and Herzegovina is as it was with us after the war. You can buy one for peanuts.' --DailyExpress.co.uk. • Rio 2016 Olympics not going to bump Brazil economy: "... Goldman Sachs' Alberto Ramos wrote in a note on Monday ... 'Furthermore, due to a number of large macroeconomic imbalances that have grown and permeated the economy and the severe drop in confidence indicators, total investment spending has actually been contracting uninterruptedly for 2.5 years. Gross Fixed Investment has now declined for ten consecutive quarters ... retrenched by a cumulative 27.0% between 4Q2013 and 1Q2016, and is now at the same level as 2Q2009.'"--BusinessInsider.com. See also: Carpet Cleaner Sues For Its Right to Tweet About the Olympics | gizmodo.com. • While easing interest rates to 0.25 percent (ECB is at -0-), Bank of England Governor Mark Carney said Britain could “handle” Brexit and insisted there was no danger of a recession. Referring to the outcome of the EU referendum, he spoke of the resilience of the British people and said the economy would continue to grow instead of stalling like much of the EU economy. 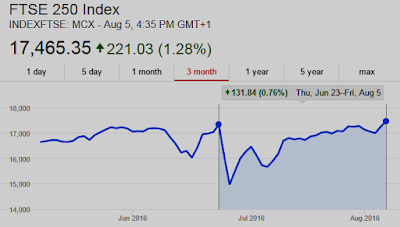 The London Stock Exchange FTSE 100 ended the week UP 1% to close at 6,793.47 (see chart below). See Don’t blame Brexit for this rate cut. Blame Project Fear | telegraph.co.uk and Britain will succeed after Brexit insists Bank of England boss Mark Carney | Daily Express | express.co.uk. See also: Experts and the future | Matt Ridley | rationaloptimist.com: "The expert pollsters told the hedge funds Remain would win right up till when it lost, so the pound and the FTSE 100 rose, then crashed. 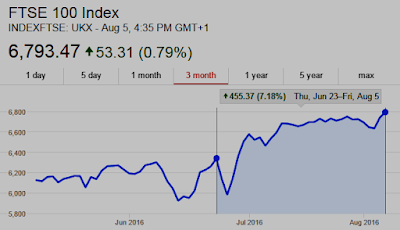 The expert financial forecasters then told investors the FTSE 100 would fall further, but it quickly recovered all its lost ground and more. 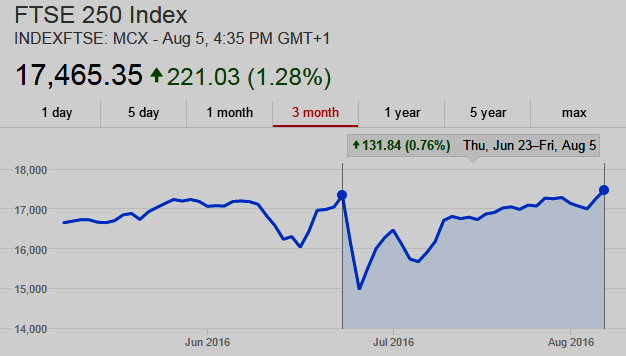 The expert analysts told us we should watch the FTSE 250 plunge instead, but that has now returned to the level it was at a week before the referendum (see chart above) ... there are no experts on the future. Explaining the present and the past requires expertise: “it’s your carburetor/prostate”. In forecasting the future, experts are generally no better than everybody else. They might be worse." "I have no real opinion on the case generally or the ccTLD/ICANN dispute. But I think this is mistaken – of course if a registrar subject to an order chooses to resist the order and/or destroy the registry he can do that. But subject to a lawful order, there is no reason to think that rebuilding the registry would be necessary – the court would simply order its transfer to the new registrar and an compliant loser would make the transfer ..."
Apparently, CCWG participant(s) do not know the difference between a registrar and registry operator! The Bad: "... the [IRP] review panel findings cast heavy doubts on ICANN’s competence to manage without oversight." --ICANN can't: independent review finds group incompetent | TheStack.com. The Dot Registry IRP Declaration posted by ICANN on August 2, 2016, received critical commentary this past week, see ICANN IRP, Dot Registry New gTLDs INC LLC LLP, Tempest in a Teapot? The declaration (pdf) was a split decision (2-1), but included severe criticism of ICANN staff and the ICANN Board of Directors, including its Board Governance Committee (BGC). While I have also been, and continue to be, a critic of the ill-advised and misbegotten new gTLDs program, both the policy and its implementation, as well as failures of ICANN leadership, in fairness, it should be noted the IRP (Independent Review Panel) declaration not only was a split decision, but the dissenting opinion stated, correctly I think, "The 'communities' proposed by Dot Registry ... do not demonstrate the characteristics of 'communities' under any definition" and therefore Dot Registry should not have passed the CPEs (Community Priority Evaluations) for .INC, .LLC, and .LLP. "September 30, 2016, is fast approaching, and ICANN management and staff, particularly at the “Global Domains Division” (GDD) seem ill-prepared--still engaging in unprofessional, incompetent, inept or opaque practices ... Hopefully the ICANN Board and new ICANN President & CEO, in the near future, will reorganize ICANN’s corporate operational structure, and staffing, abolish the GDD completely (a GDD President is one too many “Presidents” for ICANN), and move “Contract Compliance” into a separate division or department that includes consumer trust and protection, as well as domain name registrants’ remedies and advocacy, reporting directly to the ICANN President & CEO, and the ICANN Board." I would now change the reference to "ICANN legal, Jones Day" above, to a new independent outside counsel to the ICANN Board of Directors solely for the purpose of advising and educating ICANN directors of their duties under California and other applicable law, and providing independent legal advice concerning issues that come before the Board. ICANN legal staff and Jones Day are conflicted, representing corporate management and staff, and the corporation, respectively. The IANA transition end date, September 30, is only weeks away, and the Dot Registry IRP Declaration makes it clear the ICANN Board, ICANN management and staff, are not ready. • ICANN Quarterly Stakeholder Report – Register for the FY16 Q4 Call on 18 August‬‬ | ICANN.org: The FY16 Q4 (ended June 30, 2016) Stakeholder Call, will take place on 18 August at 1500 UTC. The call will focus on how ICANN has implemented the community's policies for the quarter ending 30 June 2016. More info at the link above. • Request for Proposal Announcement - DNS Abuse Study - ICANN: "A number of safeguards were built into the [new gTLDs] Program that were intended to mitigate rates of abusive, malicious, and criminal activity in these new gTLDs, such as phishing, spam, malware distribution, and botnet command-and-control. ICANN is currently engaged in a review of these safeguards and their effects on rates of DNS abuse, and is seeking a provider to conduct a study examining rates of malicious and abusive behavior in the global DNS." Participant RFP proposals due by 25 August 2016 by 23:59 UTC. More info at link above. 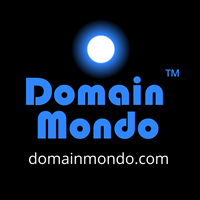 • Future Rounds of New gTLDs: Almost Free Domains for Almost Everyone | CircleID.com by John Levine: "My plan is simple: next time the application fee is nominal, say $1000. But if there are several applications for the same name, they all go to auction, and the auction income pays for the rest of the program ... This approach may seem cynical and venal. It is. But in practice is it any more so than the current approach? It may be cynical, but it's a lot simpler and a lot more transparent." • Why Registry Service Providers Should be Accredited by ICANN | CircleID.com: "... it is equally apparent that the downward spiral of Registry Service Provider pricing will lead to cut corners. The result will be a failure ..."
• Trend in Naming & Branding: Band Names Without Vowels: Why Artists Are Ditching Those Letters | Billboard: "From brands that shorten their names or use letters that don't go together to make names more easily trademarked, Cashion said the trend has spread across the business world and into pop culture. "In the short term, the challenge I tell clients is that the name might be less intuitive from a pronunciation point and in the short term it might be harder to find, but in the long term the ownability of it is higher." There's actually a name for it -- disemvoweling -- and a few years ago Wired wrote an obituary for the letter "e," in light of how many technology companies had decided to drop the most frequently used letter in the English alphabet." If you can't beat 'em ...: Uber China, Didi to merge in $35B deal - Uber (Private:UBER) | SeekingAlpha.com and The Uber-Didi deal is straight out of Peter Thiel's playbook - Recode.net: "Americans mythologize competition and credit it with saving us from socialist bread lines. Actually, capitalism and competition are opposites. Capitalism is premised on the accumulation of capital, but under perfect competition, all profits get competed away. The lesson for entrepreneurs is clear: If you want to create and capture lasting value, don't build an undifferentiated commodity business." Apple Isn't Making It in India | Bloomberg.com: "... sales in India of iOS-enabled smartphones, meaning iPhones, fell 35 percent in the second quarter from a year earlier. What's worse, that decline left the U.S. company with just 2.4 percent of a market that grew 19 percent." See also: Android Captures Record 97 Percent Smartphone Marketshare in India in Q2 2016 | strategyanalytics.com. China, Not Silicon Valley, Is Cutting Edge in Mobile Tech | NYTimes.com: "The U.S. often copies China,” said Ben Thompson, the founder of the tech research firm Stratechery. “For the Facebook Messenger app, for example, the best way to understand their road map is to look at WeChat” ... Facebook and smaller rivals like Kik are trying to replicate what has emerged in China: dominant online platforms where users will spend much of their time. Much of that effort is focused on chat. See also: China Online Retail Market To Reach Saturation Levels | ChinaInternetWatch.com: "81% of China population in tier-1 cities shop online ..."
Amazon Prime airplane debuts after secret night flight | geekwire.com: "... The Boeing 767-300 jet is part of what will eventually become a fleet of 40 planes, transporting cargo between Amazon’s distribution centers for delivery to customers. Clark said the planes will mesh with Amazon’s network of 4,000 branded truck trailers, the Uber-like Amazon Flex delivery system ..."
• Q2 2016 Earnings Season ends this week on Domain Mondo with Rightside $NAME on August 9, and Alibaba $BABA which reports on August 11--Note: as now indicated on Domain Mondo's Stock Links page, beginning next quarter, Q3 2016, coverage of quarterly earnings releases and webcasts of Yahoo $YHOO, Alibaba $BABA, and Web.com $WEB will no longer be provided by Domain Mondo. Yahoo's core assets are being sold to Verizon, Alibaba is under scrutiny by the SEC and also subject to increasing control or manipulation by the government of China, while Web.com is in transition from domains to services with higher profit margins. This will leave 5 tech companies: Alphabet (Google); Amazon; Apple; Facebook; Twitter; and 4 domain name industry companies: GoDaddy; Neustar; Rightside; Verisign; on the quarterly earnings coverage list. 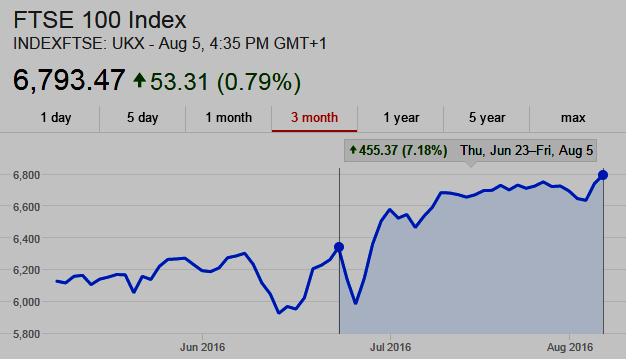 Donald Trump Warns Americans To Get Out Of The Stock Market As The Dow Falls For A 7th Day In A Row | washingtonsblog.com: "In Europe ... a “too big to fail” crisis is rapidly unfolding across the entire continent, but most Americans are totally oblivious to what is going on over there. Instead, our major news outlets are feeding us an endless barrage of negative headlines about Donald Trump and a steady stream of positive headlines about Hillary Clinton. I wonder who they want to win the election? Of course I am being sarcastic. The days when the mainstream media at least pretended to be “independent” are long gone." Keep An Eye On: Google has sold 30 million Chromecasts, 5 million in the past 2 months | 9to5Google.com. Dinosaur Watch: Another Retailer Leveraged Buyout Bites the Dust | WolfStreet.com. "... malls are getting hit as previously “pent-up” real-estate demand from retailers is expected to “fizzle.”... Mall Owners Begin to Feel the Pain of Brick & Mortar Retailers"
The Paradox of Quant | thereformedbroker.com: "Once crowded, there are a few choices for practitioners of a given investing discipline: pretend it’s not over; adapt and move on to the next thing; leverage up; sell out to a competitor." Geopolitical Watch I: EU ‘unsustainable in its current form’| EurActiv.com: S&P Global Ratings added its voice to the growing number of politicians and analysts calling for change. “... the EU, as it’s currently constructed and operates ... [is] unsustainable in its current form,” S&P said ... A clear response is needed to address uncertainty about the future of the EU and to make it relevant to citizens ..."
Geopolitical Watch II: For Post-Brexit British Vacationers, Staying Home Now Seems Appealing | NPR.org: "... Just off a beachfront carousel, Matthew Kirk's little boy squeals for ice cream. His dad says British resorts, some of which have seen better days, could rebound amid all this. Kirk says he's happy to help the local U.K. economy. "It'd be nice to see them making a living and thriving"..."
TCO - Total Cost of Ownership: How Much Do Car Maintenance Costs Increase with Mileage? | YourMechanic.com: "The average car costs $1,400 to maintain up to 25,000 miles, then costs rise rapidly until 100,000 miles. Toyota wins as the cheapest car to maintain." Zika vaccine: NIH begins testing investigational Zika vaccine in humans | National Institutes of Health | NIH.gov and Zika vaccine gives complete protection and is ready for human trials, say scientists | telegraph.co.uk.